Serious Bodhrán players, both the novice and professional alike, appreciate quality and versatility which is exactly what Mance Grady provides in his fine quality instruments and accessories at Ace Bodhráns. 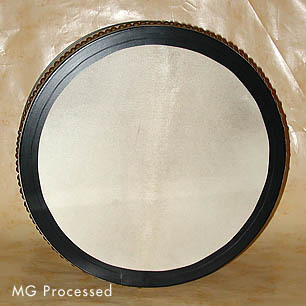 Mance Grady starts with the MG Traditional Bodhrán, an excellent instrument in and of itself. Where does the versatility come in? Because you can later convert your MG Traditional Bodhrán into a tunable drum, besides alter or upgrade your Back Options or add artwork to further personalize your drum. See the full range of options, the widest selection in the world, right here. Check out Mance's own line of quality Student Model Bodhráns. All professional quality Bodhráns have a final finish of several coats of polyurethane to provide additional protection. specially treated to enhance the natural grain. Additional charge for these special finishes.Call for pricing. Special finishes can only be chosen when first ordering your bodhrán. Once the skin is joined to the rim, the option to have a special finish is no longer available. Would you like a custom color, contact us. Student Model Bodhráns available in Maple only. "I prefer the sound and response of goat skin heads. As far as I'm concerned, if a maker is using skins from species not native to Ireland..he isn't making a bodhrán." Some people prefer processed while others choose raw. Mance's choice is always quality  which is what he offers you in skin choices for your bodhrán. Skins are naturally unique. What is shown here is representative of that "type" of skin. Call for pricing or if you have any questions. (shown with tunable system) Call for pricing. When you order just the Pro Adj. Bar, it comes encased in comfortable neoprene rubber just like that used with the Fixed Padded Post above. Professional Adjustable Bar - Threaded metal single rod (covered with a comfortable neoprene sleeve) that you can move closer to or farther from the skin, or place on a diagonal to the skin. Call for pricing. You can see the Professional Adjustable bar shown below in conjunction with the Slide Bar. 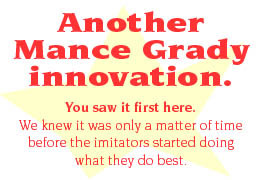 Grady Slide Bar - Mance's own invention developed to help the player access tones quickly and enable you to have the option to maintain tremendous pressure on the skin to really capture those popping high tones everyone loves. (Professional Adjustable Bar included - call also be placed on a diagonal to the skin.) Call for pricing. Grady Tunable System - Maximum efficiency in an easy to use tunable option for your drum. Can be installed right away, or you can have it retro-fitted on your Grady drum at a later time. Call for pricing. Not available for Student Model Bodhráns. 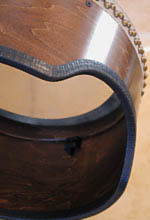 If you find the edge of the bodhrán feels uncomfortable while you're playing, try Mance's new "Comfort Edge" trim. Smooth and lightweight, just what you need for hours of comfortable playing. Here's a cool, textured edge which can be used on both the classic frame and frames with a cut-out.